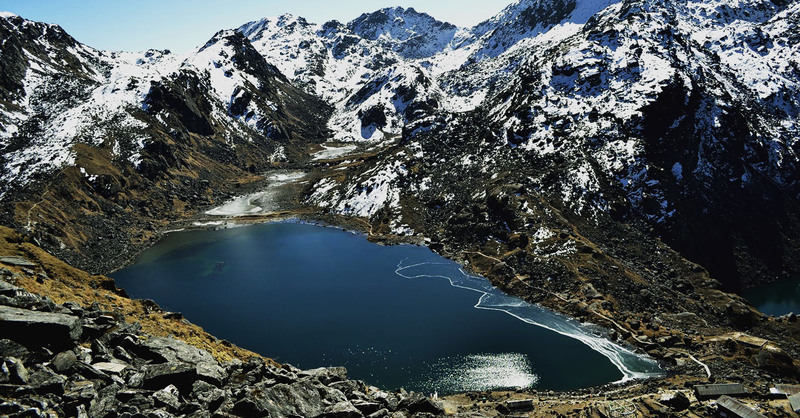 Nested high at 4380 meters in Langtang National Park lays one of the scenic landmarks of Nepal, The Gosiankunda Lake. An alpine freshwater lake, The Gosiankunda is one of the premiere hiking destinations of Nepal. And over the course of one’s lifetime, hikers won’t forget the jaw-dropping experience gained during their ascent and stay at highlands of the Langtang region. Though there are various hiking possibilities in Nepal, the Sundarijal-Gosaikunda trail is one that hikers always aim to nail once in their lifetime. The trek stretching from Kathmandu to Gosaikunda follows the watershed hills atop the mystical crest. The route offers an arduous ascent packed with pristine waterfalls, narrow paths running through the falls, unspoilt forests and steep rocky terrains. The forests are largely covered with various varieties of fern, deciduous oak and maple, and evergreens like pine, and various types of rhododendron. Although the hikers negotiate difficult and sometimes dangerous terrain walking about 8 hours a day, the journey continuously bestows travelers with spectacular views and courteousness of the common folk. How to get there? : Travellers begin their climb from Sundari jal located at 1 hour drive away from Kathmandu and walk past the jungles and bushes through Shivapuri National Park and end the day at Chisapani, a hill station at 2900 meters offering stunning views of the Langtang, Ganesh and Gauri-Shankar Mountain. The second day travelers climb uphill through rocky terrain passing through foggy roads and hill tops with spectacular views of the mountains and hills around. The day ends at either Kutumsang or Mangengoth depending upon the time taken by climbers to climb, as the terrain only demands uphill ascent. And not to forget, one should always end the day with Garlic soup or black tea (a typical survival drink of the region) offered by Lamas providing home stay services. Basic accommodation is easily available at the region during these two days. In the third day, the hotels should be pre-booked as there are only few of them. The third day trekkers begin ascending from around 3400meters and hike up to Fedi walking past landslides and canyons with rapid flow of water sprouting out from the 108 lakes in the Gosaikunda region. Trekkers deal with dangerous terrains and if lucky, one can spot rare wildlife like, mountain Himalayan black bear, the goat-like Himalayan tahr, rhesus monkeys and red pandas. However, small breed of Yak, mountain mouse, birds like Himalayan Monal, Tibetan Snowcock, Ibisbill and Pied Thrush, Khalij pheasant are common sightings in the region. Moreover, Lantang National Park is considered to be an excellent bird watching and nature hiking destination. The park is ranked 3rd among the best National Parks and trekking destinations in Nepal . Apart from the trail, the trekkers can also take mini-detours to the prestigious Buddhist monasteries along the way. The third day of the trip offers trekkers with many wonders to ponder upon. However, the best is yet to come. The third day ends at Fedi, a hilltop located besides a canyon at 3700 meters. Sherpa are the common residents of the area who run home stays at the highlands. Once at Fedi, climbers feel atop the clouds as the terrain provides views of far and distant hills and down your eye range with clouds of white and grey hovering over those hills. The fourth day, trekkers battle with a different terrain, no more trees and pine jungles but mountains covered with grass and poisonous flowers nested at the high altitude rocky terrain. Moreover, cases of high altitude sickness are reported in the area during the last day climb. However, the risk is worth it once you climb up to 4610 meters, the Lauri Bina La Pass marks the outskirts of the mystical Suryakunda Lake, the first lake amongst many along the way to Gosaikunda. From Suryakunda, trekkers start a half an hour downhill hike to 4380 meters to Gosaikunda. Apart from being the highly praised Alpine Freshwater lakes of Nepal, Gosaikunda also has a great religious significance to Hindu and Budhhist pilgrims. According to Hindu Mythology, Gosaikunda is considered to be the abode of Lord Shiva and Gauri. Scriptures credit the creation of lakes to Lord Shiva who pierced the mountains with his trident to quench his thirst and end the pain after swallowing immense amount of poison he swallowed from the primordial oceans. The Gosaikunda trek is a majestic journey one should endeavor as it surely will baffle your senses. This entry was posted on Thursday, August 10th, 2017 at 9:58 am and is filed under Adventure, Travel. feed.